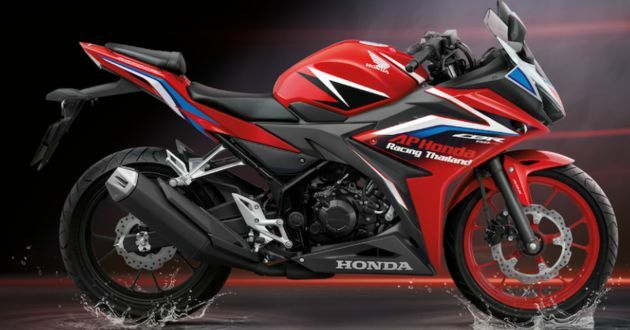 Aside from the launch of the Honda CBR250RR, the Thailand market also gets the facelifted 2019 Honda CBR150R. Priced at 92,000 baht (RM11,820), the facelifted CBR150R was launched in Indonesia last year. Amongst changes on this year’s model of the CBR150R, aside from the graphics, is a taller windshield and sharper headlights. A wavy petal style front brake disc has been fitted as well as limited adjustment suspension front and rear. Inside the cockpit, a digital instrument panel can be found, with new display colour, while the CBR150R’s safety systems have been upgraded with optional ABS and Emergency Signal Stop (ESS) that flashes the brake light under hard braking. Everything else on the CBR150R remains the same, including the engine, in this case a single-cylinder DOHC 149.16 cc fed by EFI. Mated to a six-speed gearbox, the CBR150R produces a claimed 17.1 PS at 9,000 rpm and 14.4 Nm of torque at 7,000 rpm. In Thailans, the 2019 Honda CBR150R comes in four colour options – Black, Blue, Red and Repsol racing livery. The base model of the CBR150R is priced at 92,000 baht (RM11,820) while the ABS-equipped version goes for 94,000 baht (RM12,077). The post 2019 Honda CBR150R facelift – RM11,820 in Thailand appeared first on Paul Tan's Automotive News. 0 Response to "2019 Honda CBR150R facelift – RM11,820 in Thailand"